When we first saw this tin, we thought it was a real vintage piece. Happily, it wasn’t--it’s a great re-creation of a classic Deco design. Better yet, it holds sugar free mini mints. Imagine the “oohs” and “ahs” you’ll hear when you pull the tin out of your pocket or purse. 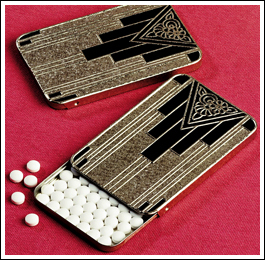 And when the mints are gone, the case can hold some pills or business cards.